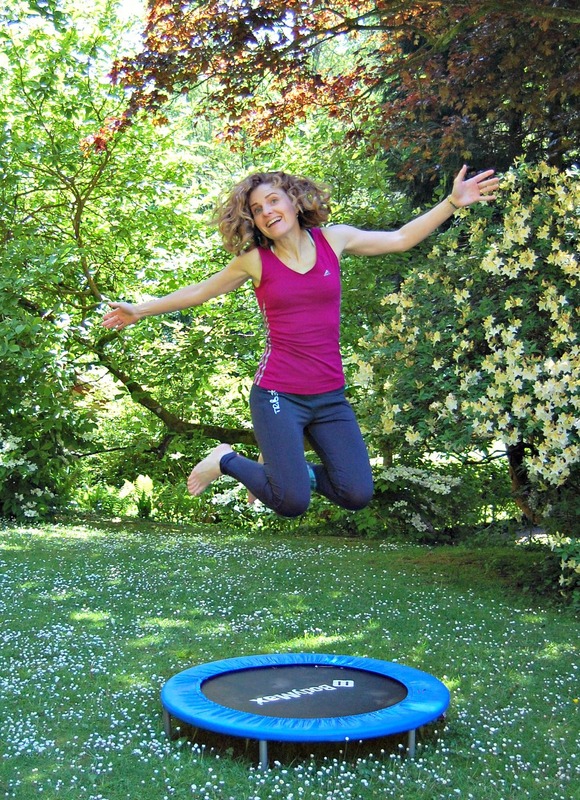 If you have kids and even a tiny patch of garden, the chances are you have a trampoline. They’ve become massively popular amongst families as they can keep kids entertained – outdoors! – moving! – for hours on end. I remember one of my sons once spending an entire day bouncing. But trampolines aren’t just for children. They are an incredibly efficient and easy way to get fit for adults, too, without stressing your joints. 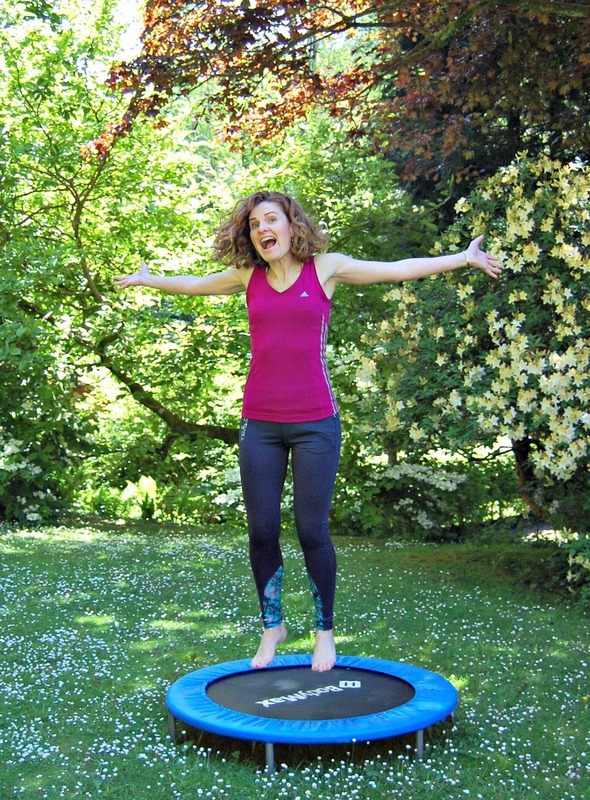 A NASA study (yes, the space dudes) on the physical effects of rebounding (a fancy term for bouncing on a mini-trampoline) found that it was way superior to running when it came to raising your heart rate, and when it came to oxygen uptake it was about 68% more efficient. 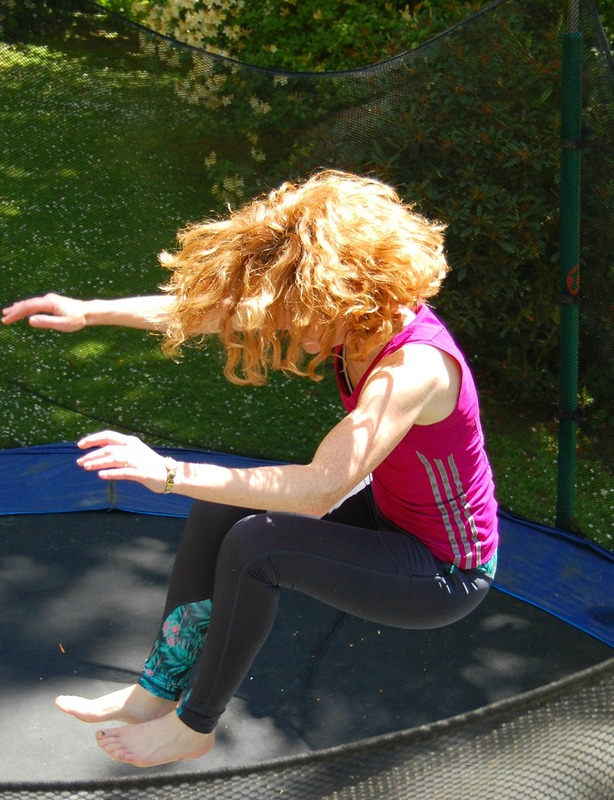 Trampolining is low impact, it strengthens your muscles, helps with balance and coordination and is said to strengthen your cells and increase your lymph flow and circulation. If that weren’t enough, it gets you well and truly out of breath (it’s waaaay more energetic than it looks!) and – *wait for it* – is said to reduce cellulite. Win, win, WIN! This couldn’t be simpler to use. Just bounce around on it a bit, or jog on the spot. It looks small and inoffensive, but you’ll be surprised how quickly you’ll feel the effects. The mini-trampoline is not the place for stunts or tricks, for obvious reasons. You can really have some fun on a full-size trampoline. As you’ll see from the pictures, my technique leaves a lot to be desired. I actually had a few lessons at school, but evidently haven’t remembered them. Whatever – it’s so much fun and absolutely knackering. In addition to just jumping up and down, you can safely do seat drops (where you land in the sitting position), star jumps, pike jumps (like I’m attempting – badly – above) and tuck jumps (below – ditto!) If you’re going to move on to anything more ambitious, it might be worth taking a class or two so you can be sure to do them safely. If you don’t want to be one of the many thousands of trampoline-related A&E statistics, be sensible. It’s easy to get hurt. Only ever go on the trampoline alone. It’s really dangerous to have more than one person on the trampoline at any one time (even sitting on the padding). Never, ever bounce on the trampoline with a child. You could bounce them right off. Bounce with care – a bad landing can lead to fractures, sprains or broken bones. If you’re not sure about what’s safe and what’s not, investigate taking lessons – lots of leisures centres offer them. 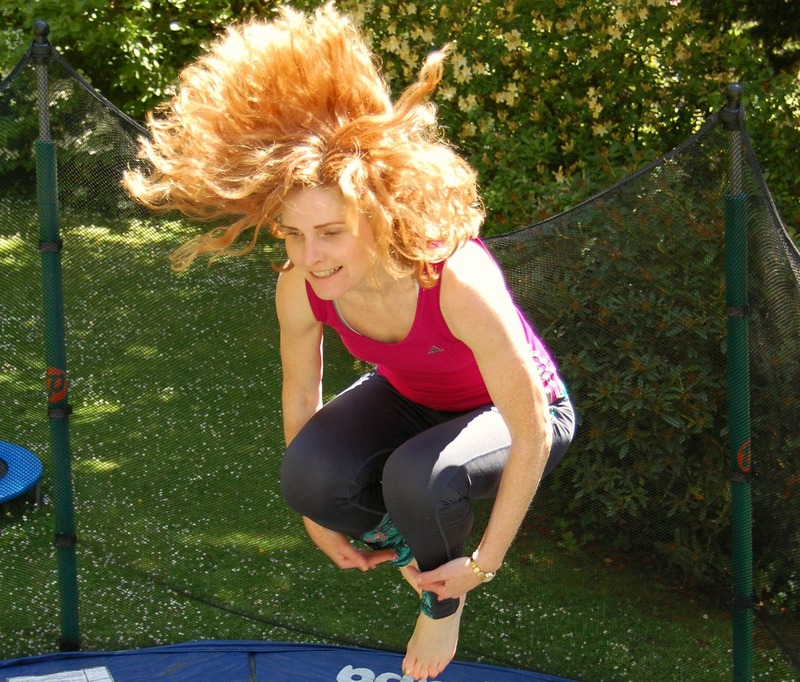 There are a few other issues that women have with trampolines. First of all, wear a sports bra if you’re going on a trampoline or rebounder for any length of time – there’s a whole lot of jiggling going on. 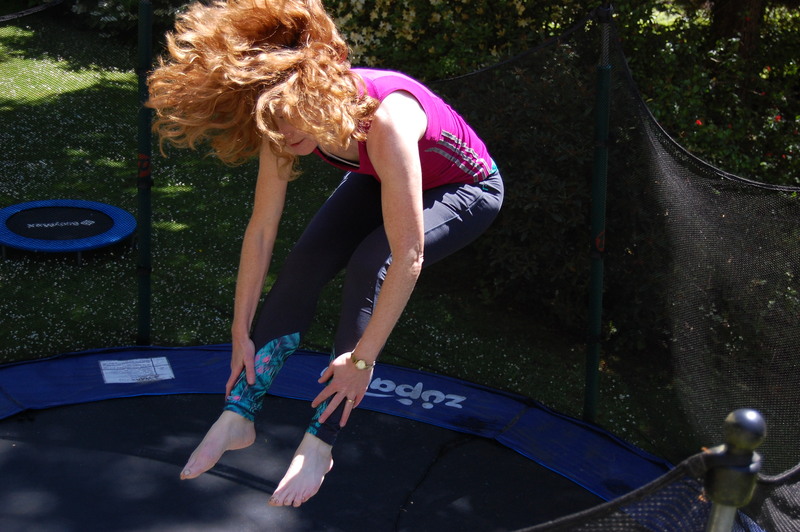 If you have had children and haven’t been very good about your pelvic floor exercises, you may find (and I’m sorry to be indelicate here) that trampolining can be a bit, er, hazardous. If it’s an issue for you, be sure to go to the loo right before you start bouncing, wear a pantyliner (how I hate that word) and above all, get to work on the PFEs. Finally, unless you want to rock the Crazy Hair Look that I’m sporting in these pics, tie it back! And above all, have some fun with it!